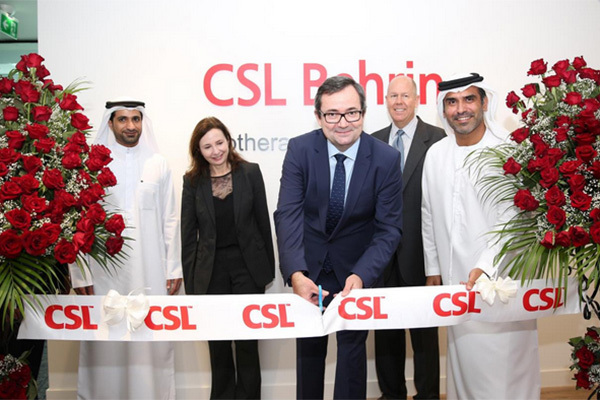 The inauguration drew the participation of Markus Staempfli, vice president and general manager for Intercontinental Commercial Operations at CSL Behring, Mohammed Haggag, general manager of CSL Behring MEA, and Marwan Abdulaziz Janahi, managing director of DSP and chairing member of the Pharmaceuticals and Medical Equipment Taskforce of the Dubai Industrial Strategy 2030. Biotherapeutics is one of the fastest-growing segments of the pharmaceutical industry. Its annual growth is estimated at more than 10 per cent, compared to conventional pharmaceuticals at seven percent. The UAE’s positive investment climate and its attractiveness as a hub for pharma and healthcare activities has encouraged multiple international companies to set up locally, especially in niche industries. CSL Behring is a leader in the $24 billion plasma market. The company’s commitment to innovation is reflected in its development of breakthrough therapies to reduce the risk of early recurrent cardiovascular events, improve the outcomes of organ transplants, and treat sickle cell disease, β-thalassemia and autoimmune diseases.